Hundreds of martial artists gathered at De La Salle Institute for Gen-Ki Karate’s 31st Annual Karate and Kung Fu Open Championship Tournament. This tournament, which was directed by Master Jerry Weiss, brought together some of the best martial arts practitioners in the area to compete in weapons, kata and sparring matches. The participants included men, women and children from various martial arts styles. 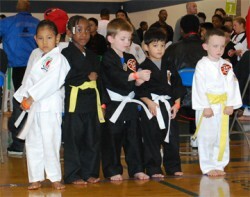 Since this tournament was open to all styles of martial arts, many local schools were in attendance. Many parents and siblings were in attendance to cheer and support the three and four year old kids who competed in their first tournament. Some parents were excited, others were worried, but most of them aimlessly wandered the floor snapping pictures and recording video as their child entered their first competition. One of the most interesting sights was to see the three and four year old boys and girls compete in sparring (fighting) matches. The expression on their faces were priceless as many of them struggled with fear as they readied themselves to fight with another child for the first time. Since this was a controlled environment, all competitors wore protective gear (head gear, gloves and cup) and in the sparring matches, the competitors were not allowed to hit the face or kick below the waist. A competitor scored points by executing a striking or kicking technique to the chest or top of the head. Once the referee said “fight,” initially hesitant, the kids would cautiously approach their opponent and once they closed the range, with lighting speed they would either kick or punch the opponent and back away…and that is how may kids scored their firs point in sparring. Once their matches ended, most of them were successful at overcoming their fear of fighting and getting hit. Although some kids cried while others jumped for joy after the outcome of their match, most were relieved that it was over and that they didn’t get hurt. Most of the martial arts instructors that were in attendance believe that tournaments can be very rewarding for competitors. “Tournaments like these lets them (competitors) demonstrate all that they’ve worked so hard for to perfect. Nobody really knows how much hard work they put in at their school or dojo. Competing in an open tournament is scary for some but if they compete and earn a trophy by placing 1st, 2nd or 3rd, they get excited and that is what builds confidence and they challenge themselves to get better,” said Master Kwan Cortez. Other martial artist believe that even if they lose a match, they still win because now they know what they need work on to better their technique. Although the judges analyzed every move that was made, many adult competitors demonstrated a well controlled and disciplined approach to the art and form. Swords and bo’s were seen all over the floor as many adults competed in weapons and kata with almost flawless techniques. The following are a only a few of the many well known and respected martial arts instructors that were in attendance: Master Kwan from the Kung Fu Academy of Chicago, Instructors Daniel and Jonathan Azpilcueta from Yoshitaka Karate Do and Sifu Wright from Wrights Traditional Kung Fu and Sensei Steve from Sensei Steve’s Karate. If you missed this tournament and are interested in competing or experiencing the way martial artists express themselves through their respective arts- the following tournament, which is also open to all martial arts styles will take place on November 18. For more information call 708-715-7376 or visit www.yoshitakachampionship.com.